Money. We may have mixed feelings about it, but most if not all of us want more of it. Attorney Patricia M. Annino has written a book for women, Cracking the $$ Code: What Successful Men Know And You Don't (Yet), which reveals some of the ways women can become more financially successful in the workplace. In this slim, easy-to-read book,which was published in 2009, she talks about the importance of valuing yourself and your time, and not selling yourself short. The author says it that it took her "a long time to realize that financial success required more than brains and hard work, and that men seemed to have an inside track." She suggests that successful men naturally employ tactics which are not instinctive to women. Women, says Annino, are often caregivers to others, and we need to learn to take care of our own needs and give ourselves permission to succeed (something men don't have to do); she also tells us to be persistent and to be responsible for setting and achieving our goals. Through her successful career as a lawyer, Annino has learned these secrets to financial success and presents them as practical lessons. Go for the "A" and earn what you are worth. Understand your value; Do not undervalue your services or contribution. Ask for it! Getting what you want and what you are worth is your responsibilty--no one else's. As soon as I started reading it, I realized that I needed some help with certain things, and this book has already changed my thinking. 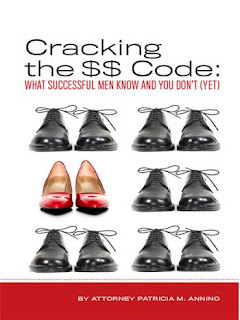 Cracking the $$ Code offers priceless advice and tips. It's an inspiring book, which I'm sure I'll refer to often and add to my shelf of valuable self-help books. Special thanks to Patricia M. Annino and Bostick Communications for sending me this book. Sounds like a book I need to read, too! You're right, Warren. Men would benefit from this book, too! Hey Suko! Thanks for the review. Sounds like a goodie! Because a lot of women AND men have told me it's changed their lives. Kim, thanks for stopping by. I think this is a great book for women to read---it's empowering. Noah, I will definitely read the first chapters of your book. Thanks for your comment! I found you through mel u, who recommended your blog. After reading this review (and a post from last week), I can see why. Also, I need this book *wry grin*. Thanks for the review. This sound like a helpful book! I need to read this. Veens, ds, and Naida, I was surprised how much I quickly learned by reading this book. More comments are welcomed, of course. Such an interesting review! Thanks for sharing about this book as it isn't one that I would usually pick up.